The PRP Survival Guide is a repository of experiences and insights shared by PRP patients and their caregivers. Collectively, the PRP community possesses a wealth of practical knowledge about pityriasis rubra pilaris. We need to harvest that knowledge for those in need of enlightenment and hope. Share what you have learned about PRP as a patient or caregiver. Share what you have been told by your dermatologist? Share articles you feel might be worth reading or websites worth visiting. Topic: The importance of HOPE in the treatment of PRP? Hope! Thankfully I found the PRP Survival Guide and the PRP Facebook Support Group. Had I not, I’m not sure how I would of coped. Having moved to another country and not fully understanding the language — never mind the medical term — I felt extremely alone as my husband was taken off into hospital covered in this itchy, bright red rash! I turned to the internet to find out what PRP was and how it was going to change not only his life but mine too. At first the information did not seem to appear, most was very basic until I stumbled upon the Survival Guide and from there to the PRP Facebook community. I needed some HOPE and both resources gave me that. My husband spent three weeks in the hospital the first time. With all the help and advise I found with the help of the PRP community, I was able to help him. While he is now in remission, I still read the Survival Guide and chat with the group. I, We, thank you for the hope, help, advise and friendships, especially to all involved in the PRP Survival Guide. To anyone new to PRP a special note from me to you: Take each day as it comes and learn what you can.It is a bumpy journey that will eventually smooth out. This has been a life line to me. I found HOPE with the PRP Facebook Support Group. Seeing and reading about what is going on with other people, and knowing others are going through the same thing that I was, made me not feel so alone. There are others who understand what I am going through. The day I requested to become a member of the Facebook PRP Support group was one of the most horrible and most uplifting days I could ever imagine. I was diagnosed on May 28, 2016 with a name that I had never heard of before even working as a nurse for 20 years. PRP has taken so many things from me, but reading the posts from fellow PRP patients and caregivers showed me that there is HOPE with this diagnosis. This group is nothing but HOPE. Finding others all over the world to help support, encourage, rant, listen, and even cry with — gives me HOPE everyday. I know that if I need someone, they are there for me. Reading the comments from others gave me the courage to not give up on my health. This illness definitely strips a person down to the core, but knowing that there is someone with similar comments and stages of healing helped me mentally to live with PRP. I now can give others support, tips, encouragement, friendship, and HOPE to continue on with this illness. I don’t think I would have improved like I have if I didn’t have this support group. 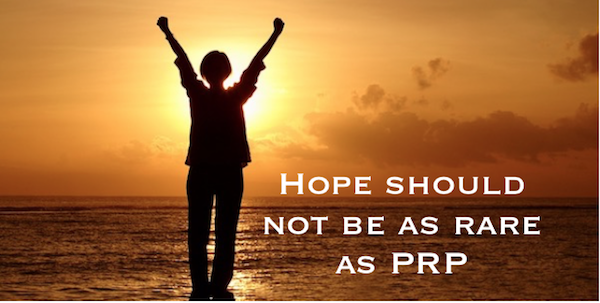 The PRP Facebook Support Group IS hope! Oh my. How do I begin to express my joy on coming into contact with this group. Thank you to my 5th doctor who was able to diagnosis this. I knew nothing and was very frightened of what was happening to my body. When the rash appeared I went to my primary doctor. He referred me to an allergist who then referred me to my dermatologist. At that time I was referred to a psoriasis specialist who didn’t diagnosis correctly. This led me to a dermatologist who had another patient with PRP. At least with her help I knew what it was. Hope. A diagnosis. I can deal better if I know what it is then not knowing anything. This site has been everything to me in my journey for the past 2 1/2-plus years. I was 9 months into this beastly disease before I was diagnosed with PRP. I looked up PRP on Facebook and found the PRP Facebook Support Group. This group has been a life line, a place where we come to lift one another up, a place to inform and be informed, a place to cry, rant and express our miseries in the darkest moments of this disease. The PRP Facebook Support Group is just that … Support! I am truly grateful for each person here and continually lifting them up in prayer for complete healing and answers to how we contracted PRP and what can cure it! At first I thought I had washed my hair in some dodgy shampoo that had burned my scalp. Then — in the following days and weeks — it spread down my face and body. It was very frightening and painful and nobody seemed to know what was happening to me. Finding the PRP Facebook Support Group and answers to my questions made an enormous difference. Having information gave me an understanding of my condition and useful practical information. It also helps to know that there are others out there that have experienced this and more importantly come out the other end. I could not have coped without the HOPE that this will one day be under control.